Buffalo Wild Wings Fundraising event to support the MVA in community projects. The MVA along with the SGA passed a bill to support Freshman veterans with parking passes. 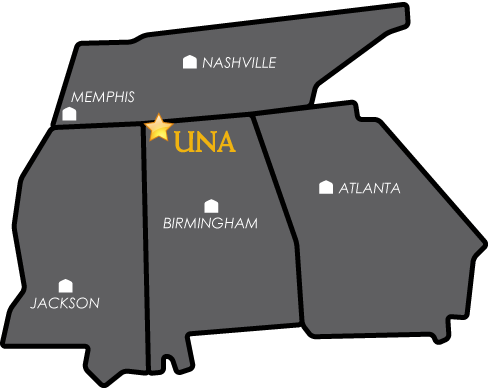 The UNA MVA participates in community events as well as campus events. In this picture, the group was participating in the Shoasl Dragon Boat. The UNA Military and Veteran Alliance was created in 2011 by advisor, Dr. Wayne Bergeron, to support and encourage military and veteran students. There have been a lot of great and exciting changes on the University of North Alabama campus since its inception and we plan to do even more. We welcome any new and inspiring members! We’ll work hard to make sure that military and veteran voices are heard on this campus and in the community. e. To morally and ethically uphold our individual oaths as veterans that, together, we have sworn as a community. f. To promote friendly relations between students, faculty, and veteran college students. If you are interested in joining our organization, please refer to the contact us section at the bottom right of the page. We also have social a media account if you would like to see what we are up to.